The American Avocet is a striking wading bird with long bluish legs and a long upcurved bill. This is a western-breeding shorebird that is a rare migrant in Tennessee. The breeding habitat includes marshes, beaches, shallow lakes and ponds in the mid-west and western states, and it winters along the southern Atlantic and Pacific coasts of the U.S. and Mexico. The American Avocet is most likely to be present in Tennessee from mid-April to mid-May and again from mid-July to mid-November. Description: This large, distinctive, long-legged shorebird has black-and-white upperparts, white underparts, and a noticeably upcurved bill. The head and neck are rusty colored in spring and gray in the fall, and the legs are grayish-blue year round. Males and females look similar, but males have a more strongly upcurved bill. Voice: Much less vocal than the Black-necked Stilt. Call is typically a single note that varies from a high, sharp kweep to a lower pwik. Similar Species: Black-necked Stilt is similar in size and habitat use, but has a straight bill, black on the back of the neck and top of head, and red legs. Habitat: In Tennessee, avocets frequent shallow freshwater marshes, open mud flats, shoreline edges, and sand bars. Diet: Aquatic invertebrates. Avocets often sweep their bill from side to side while foraging. Nesting and reproduction: The American Avocet has not been documented nesting in Tennessee. Status in Tennessee: Fairly rare migrant detected more often in Middle and East Tennessee than in West Tennessee. More likely found in fall than spring, typically between mid-April and mid-May and mid-July through mid-November. On occasion, a female American Avocet will lay eggs in the nest of another female avocet. They have even been recorded laying eggs in the nests of Mew Gulls. Avocet nests have also been parasitized by other species including Common Terns and Black-necked Stilts. 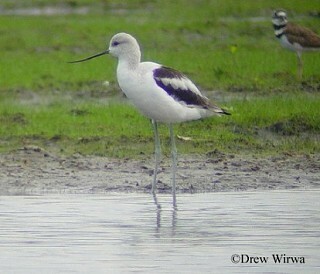 Avocets have reared stilt hatchlings along with their own young. The tip of the long upcurved bill of the avocet, like most shorebirds, if very sensitive to touch. This helps the bird detect invertebrates in the mud. Best places to see in Tennessee: American Avocets can appear in suitable habitat anywhere in the state, but have been regularly detected at Rankin Bottoms WMA, Snow Bunting Peninsula at Old Hickory Lake, and Pace Point at the Big Sandy Unit of Tennessee National Wildlife Refuge. Robinson, J.A., L.W. Oring, J.P. Skorupa and R. Boettcher. 1997. American Avocet (Recurvirostra americana), The Birds of North America Online (A. Poole, Ed.). Ithaca: Cornell Lab of Ornithology.